Denys van Alsloot (before 1593-1626) was born in Brussels where he remained all his life. In 1599-1600, he entered the service of the Archduke Albert and Archduchess Isabella who entrusted him with many important commissions. He belonged to the school of Brussels landscape artists like Jacques d'Arthois (1613-1686), Lucas Achtschellinck (1626-1699) and Lodewyk de Vadder (1605-1655). 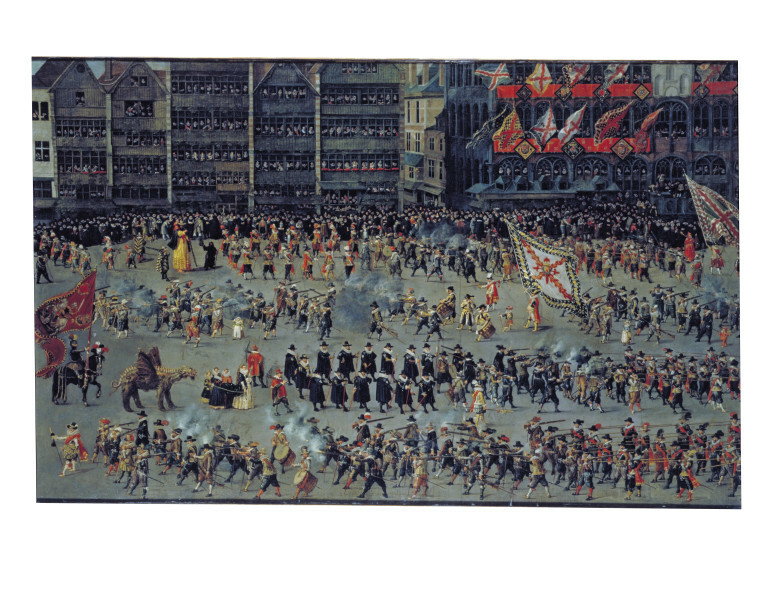 This painting which is the left part of an original unique composition (see 169-1885 for the right part) was commissioned by the Archduke Albert and Archduchess Isabella to celebrate the Ommegang in Brussels in 1615. This was an important procession that honoured the most prestigious Guild in Brussels: the Crossbowmen guild. 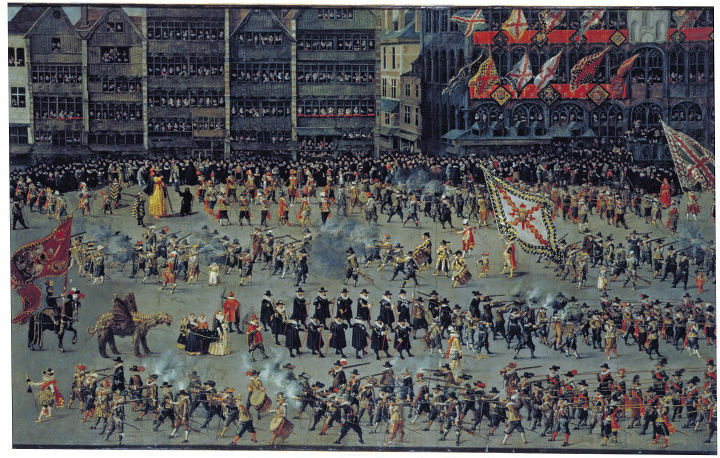 Left half of the depiction of the senior guilds procession in Brussels, displaying the guilds' banners; in the background are the typical narrow and high houses of Brussels with figures at the balconies. Commissioned by the Archduchess Isabella between May and September 1615, at her palace in Tervuren by 1619; collection bequeathed to Cardinal Infant, Don Ferdinand, Governor of the Netherlands; the Escorial; Lord Stafford (known at Stafford Castle as the 'Kenilworth Pageant); sold Christie's, 30 May 1885, lot 444; Purchased for the Museum (with 169-1885) for £262 10s. Historical significance: Sometime before September 1615 Isabella commissioned eight paintings depicting the Ommegang from Denis van Alsloot for 10,000 livres, only six of which actually seem to have been made. By 1619 these were displayed in the long gallery at the palace of Tervuren, one of the most ancient castles of the Dukes of Brabant, situated in a village north-east of Brussels. Formerly the location of an annual shooting competition between the cross-bow guilds of Brussels and Leuven, it was traditionally associated with St. Hubert of Liege, the patron saint of hunting, and also used for the entertaining of foreigh dignitaries. Stylistically, these paintings are unique in van Alsloot's oeuvre as he chiefly specialised in landscape paintings reminiscent of those painted at the turn of the century by Gillis van Coninxloo. These works are some of the best known depictions of Netherlandish civic spectacles. Of Alsloot's six paintings of the Ommegang, only four survive: two in the Prado, Madrid (Inv. P01347 and P01348) and two in the Victoria and Albert Museum (Inv.5928-1859 and 168/169). The last of these was divided in half at an unknown date. Fortunately, an undivided replica of it made around 1635 survives in the Musée Royal des Beaux-Arts, Brussels (Inv. 171), together with a copy of one of the paintings in the Prado (Inv. P01347). This painting (168-1885) is the left hand side the composition continued in V&A no.169-1885. For this reason, both halves of the composition are described together here. The scene is set facing the North side of the Grand' Place with in the centre the "Maison du Roi", in which several ducal tribunals and the Guilds of the Crossbowmen, the Swordsmen and of the Arquebus had their headquarters (see Sabine van Sprang, Le peintre et l'arpenteur…). For the following account of the subject-matter of 168/169-1885 see C.M. Kauffmann (1973): The senior guilds, or Serments en armes are depicted, each accompanied by the image of its Patron Saint or Saints and by standard bearers, drums and fifes. Beginning at the right hand upper end of 169-1885, the procession is headed by the Escrimeurs, or Fencers, and in their midst are Saints Gudule - a devil is trying to blow out her lamp - and Michael, brandishing a sword and holding the devil by a chain. The Fencers are followed (on the left of 168-1885) by the Arquebusiers, or Musket-makers, led by an enormous St Christopher carrying the Christ-child and accompanied by a hermit with a lantern; in the second row ranks of musketeers, etc., a banner with the arms of Luis de Velasco, Marquis of Belveder and commander of light horse in Flanders, impaling the arms of Anne de Hennin, daughter of James, Marquis of Veere and Flushing. The next guild is that of the Archers (second row centre of 169-1885) headed by two attendants each carrying a bow and arrow; the captain is accompanied by a female dwarf heading three ranks of musketeers; in the centre of the row below two horses pulling a sledge with St Nicholas. In the same row (on the left of 168-1885) come the Lesser Guild of Crossbow-makers (Petit serment des Arbalétriers or Serment de St Georges), headed by St George - whose banner includes the arms of Brussels and of the Archduke Albert - and the captive dragon, followed, in the bottom register, by the captain with the usual ranks of musketeers, drummers and members carrying pikes. Flemish painters of the 15th-17th centuries were internationally renowned for their painstaking naturalism and exact depiction of contemporary scenes. Pieter Brueghel the Elder (1525/30-69) developed a new genre of large townscapes peopled with numerous small figures engaged in pastimes, processions and other activities, which was widely popular and much imitated by later artists. The great cities of Flanders were the setting for numerous civic festivities and processions, typically organised by guilds and other corporate organisations on major church holidays or to celebrate the ceremonial entries of rulers and other dignitaries. In Brussels, the capital of Brabant, power was divided between the patriciate and the so-called nations - nine civic bodies representing the 48 craft guilds. From 1576-85 Brussels was the capital of the newly formed United Provinces, in revolt against the Habsburg rulers of the Netherlands. In 1585 the city capitulated, was purged of Calvinists and its patriciate reinstated. The Archduchess Isabella (1566-1633), the daughter of Philip II of Spain, married the Austrian Habsburg Archduke Albert, governor of the Netherlands, in 1597, and she continued to govern after his death in 1621. Denis van Alsloot (before 1573-1625/6) is recorded as a master in Brussels in 1599, and received commissions from Isabella and Albert from 1603. They developed their own propaganda to link the Habsburgs with concepts of peace and good government, and established a solid alliance with the Brussels patriciate. 1. That it was held to commemorate the translation of the miraculous image of the Virgin from Antwerp to this church in Brussels. 2. That it was held to commemorate the victory of Duke Jan I of Brabant at Woeringen in 1288. 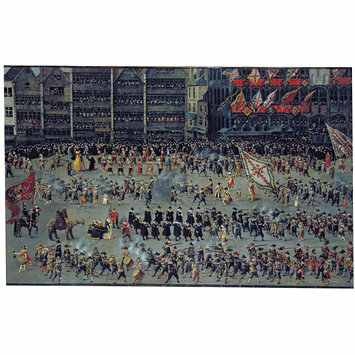 It was thus regarded both as a celebration of collective, civic piety and as a civic victory parade commemorating the military prowess of the Dukes of Brabant. At the Ommegang held on 31 May 1615 the Archduchess Isabella was crowned Queen of the Cross-bow Guild after shooting a jay attached to the spire of the Church of Notre-Dame-du-Sablon. In that year the Ommeganck was celebrated with more than usual splendour, and may be interpreted as expressing the political alliance between the court and patriciate, and an ideal of unity under the patronage of the Archduchess Isabella. In 2015, to celebrate the 400th anniversary of this Ommegang, the 12 Star Gallery and the V&A’s Theatre and Performance Department organised an audio-visual display at Europe House, 1615: Power, politics and performance at the heart of Europe, 22nd July - 11th September. The display consisted of high-quality digital reproductions of the whole surviving series with an accompanying animated film. The reproduction prints were produced in conjunction with Advanced Imaging Laboratory of Kyoto University. C.M. Kauffmann, Catalogue of Foreign Paintings, I. Before 1800, London: Victoria and Albert Museum, 1973, p. 3-5, no 4. P. Baesten, 'L'Ommeganck de Bruxelles en 1615 d'après les tableaux de Denis van Alsloot' in Précis Historiques, 38-9, 1889-90, passim, esp, pp. 337-61, 533-53. A.-J. Wauters, Denis van Alsloot, Bruxelles 1809, p. 18 ff. J. Laver, Isabella's Triumph (Faber Gallery), 1947. E. Larsen, 'Denis van Alsloot, peintre de la forêt de soignes' in Gazette des Beaux-Arts, xxxiv, 1948, pp. 348 ff, fig. 12. L. van Puyvelde., 'De Ommergang te Brussel in 1615 .. .' in Koninklijke Vlaamse Academie voor Taal-en Letterkunde, Verslagen en Mededelingen, Ghent, 1958, pp. 117-29. Luc Duerloo and Werner Thomas, Albert & Isabelle, 1598-1621, exh. cat. Musées Royaux d'Art et d'Histoire, Katholik Universiteit Leuven, Leuven: 1998, p. 204, fig. 284. Margit Thofner, 'The Court in the City, the City in the Court. Denis van Alsloot's depictions of the 1615 Brussels "ommegang", Nederlands Kunsthistorisch Jaarboek, vol. 49 (1998), pp.184-207. Le peintre et l'arpenteur : Images de Bruxelles et de l'ancien duché de Brabant exh. cat., Musées royaux des Beaux-Arts de Belgique, Bruxelles: 2000, p. 252. Johan Verbeckmoes, 'Parading hilarious exotics in the Spanish Netherlands, Nederlands Kunsthistorisch Jaarboek, vol. 53 (2002), pp.52-69.